Part fruit machine, part TV-style gameshow, Hit It Big is an unusual 5 reel, 5 payline video slot from ELK Studios. In the base game, you could trigger modifiers which award multipliers prizes of up to 50x, respins, stacked wilds or locked wilds. There’s also multi-level pick me feature. Play on all devices from between 20p and £100 per spin. The bright, colourful visuals here are simple but nicely done. On the reels you’ll see single, double and treble Bars as well as green, blue and red 7s. The best standard symbol is the triple set of golden 7s which pays 7, 25 or 50 times your bet if you land 3, 4 or 5 on a payline. There’s also a wild, the golden crown, which substitutes for everything apart from the bonus symbol. Above and below each reel you’ll see a coloured button, each of which contains a modifier feature. These change with each spin. If you land the same matching feature above and below the same reel on the same spin, you’ll win that modifier. Here’s what’s on offer. It’s possible to land multiple modifiers on the same spin. Land 3 of the Bonus symbols on the same spin and you’ll trigger the Hit It Big Bonus Game feature – you’ll then be taken to a new screen and shown a 5×5 grid made up of an outer circle, inner circle and the Hit It Big centre screen. You’ll start on the outer circle. A marker jumps around the circle (a bit like the prize board in Catchphrase!). Press stop. A multiplier prize is awarded depending where on the board the marker stops. That position then turns into a Bandit. The process is then repeated. You’ll be hoping to land an arrow pointing inward as that takes you to the inner circle. An arrow pointing outwards takes you back a level. Land on a Bandit and the round comes to an end. The goal is to reach the Big Hit centre screen which is where the biggest rewards are on offer. The multipliers here are up to 1,000 times your bet. Hit It Big is quite an unusual game. The way the modifier extras are triggered in the base game is rather different. It’s not your standard pick me round either. The gameplay works rather well though. If you like volatile action, then Hit It Big delivers too. The variance here is very high so expect potentially big bankroll swings. 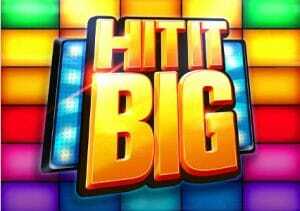 You can win 2,500 times your bet in total from the Hit It Big Bonus Game feature. We enjoyed Hit It Big. It’s not brimming with backstory and the lack of free spins may put some people off. If you want volatile action with a twist, then Hit It Big delivers just that. I also suggest you try ELK Studios’ Ecuador Gold which is just excellent.